If you want to practice ringing up transactions in XpertMart™ before doing it for real, you will want to setup a special database that you can practice with. Recall that all of your data is stored in a database called Main.gdb in the C:/Main directory. Any time you modify the database such as by adding a new Style or making an Invoice, this information gets written into the C:/Main/Main.gdb database. As you will learn when you read about our Philosophy of Control, you cannot erase transactions once they are made. Therefore, you want to be very careful about ringing up dummy transactions because these will get recorded into your database and distort your sales figures. After you have entered sufficient data into your real database (C:/Main/Main.gdb) to practice with, make a copy of it exactly as you would if you were making a backup, only this time rename it "MainPractice.gdb". You must exit the system for the change to take effect. When you reenter, any modification to the database will be written onto the MainPractice.gdb file (and not the Main.gdb file). Practice away! When you are done practicing and ready to go back to working on your real database, once again enter the Configure>FileConfigure>Database Menu and point XpertMart™ back to the Main.gdb file, as shown below. 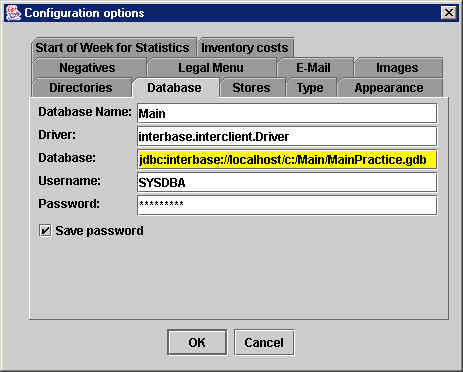 IMPORTANT NOTE: XpertMart™ looks for a database named exactly the way you named the file in the Configure>FileConfigure>Database Menu. If you make a mistake entering the name of the database and accidentally enter "MainParctice.gdb" for example, the system will look for a database filed named exactly that. (XpertMart™ is, after all, an inventory control system and not a mind reader). And then you will be out of luck because no such file exists and when you launch XpertMart™ it will seem that it has gotten stuck or frozen up, and indeed it has, looking for a file that does not exist. Fortunately there is a way out. 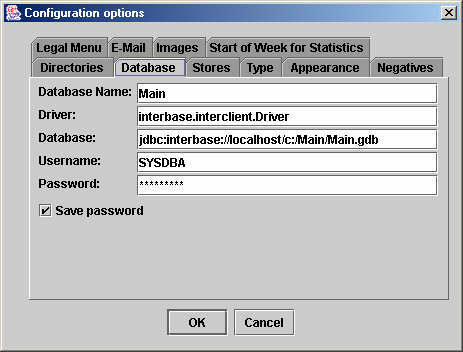 The information you enter into the Configure>FileConfigure>Database Menu gets automatically written into a small file called GeneralConfig that is stored outside of your database file. So if you accidentally entered "MainParctice.gdb" this is where that file name got stored. If you delete the GeneralConfig file found in C:/Main, XpertMart™ will automatically revert back to looking for a database file called Main.gdb. 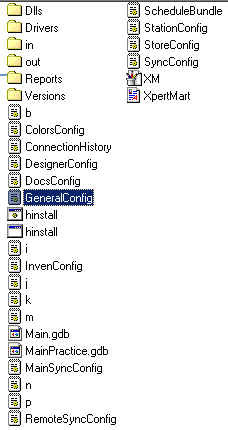 The next time you launch XpertMart™ it will automatically regenerate the GeneralConfig file. Just remember that when you get back into the system you are back to using the real database file and not the practice one.